Interesting finds in a car? Posted: Sun Dec 23, 2018 5:05 pm Post subject: Interesting finds in a car? Have you ever found anything interesting hidden away in a car you've bought, perhaps in an ash tray, or beneath a seat squab? I once found an old leather wallet. Sadly there was no money in it. Although there was a stack of 1930s-1950s tax discs, not one of which related to the car the wallet was found in. These went on to be featured on the main site as examples of tax discs over the years. What did you do with the gin? My current, temporary daily driver, I discovered had two jacks and wheel braces.....one, behind a side panel, where it ought to be...the other, in a lift up locker under the rear floor...obviously where it ought to be as well. I found lots of old 30's and 40's fag packets in my 37 Ford, some still had cigarettes in them. When I was 19 I bought a Singer Gazelle off a farmer, I picked it up the next day and when I got it back to where I worked on my cars I found a sack of freshly drowned kittens in the boot. Lovely! The sack and contents were returned onto the perpetrators front lawn at 1am. He was lucky they weren't posted through his letter box. In 2004 I bought a grey import 1994 Mitsubishi Pajero 2.8 SWB manual direct from the importer in Dublin. It proved to be a good buy but it had one annoying fault - a rattle at low revs and a resonance or buzzing noise from under the bonnet at 3000 rpm in 5th gear only. I looked and looked but just couldn't find anything amiss. In the end I took to a mechanic friend who heard the noise but he couldn't identify the source of the noise either. One evening I removed the sump guard (and rather wished later that I hadn't because it was a pain to replace) and shone a torch onto the engine from underneath. The beam reflected off something shiny under the one of the two battery trays. This is what was causing the rattle and the resonance/buzzing. 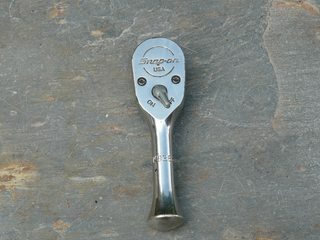 Yes, a Snap On Stubby ratchet with a 10 mil extended socket. Somewhere in Japan there must have been one annoyed mechanic cursing the loss of one of his tools. It has pride of place in my tool collection. Old driving licences, not found by me came via my father. I wish DM would post smaller pic's I can hardly read any of this on my IPad! No problem, just found out how to resize the pic's on my Ipad. I once bought an Alfasud Sprint from a Chinese restaurant in Manchester. In the 90s I bought a BMW and gave it a good interior clean, removing the back seat squab. Underneath were several "interesting" sachets containing white powder. I once found something similar tucked under the central instrument binnacle of an old Mini, though it may have been more like crystals than powder. Whatever it was I washed the contents down the sink and worried until the bin men came and took the packet away too. ... and worried until the bin men came and took the packet away too. Easiest thing if you have something "iffy" like that to dispose of is to wait until bin-emptying day and put it in someone else's bin.